Gross Area: 48,500 sq. ft.
Area Per Student: 48 sq. ft. Overall, this is a clean-looking project. Given the context, what they did is inventive. They achieved what they set out to do. 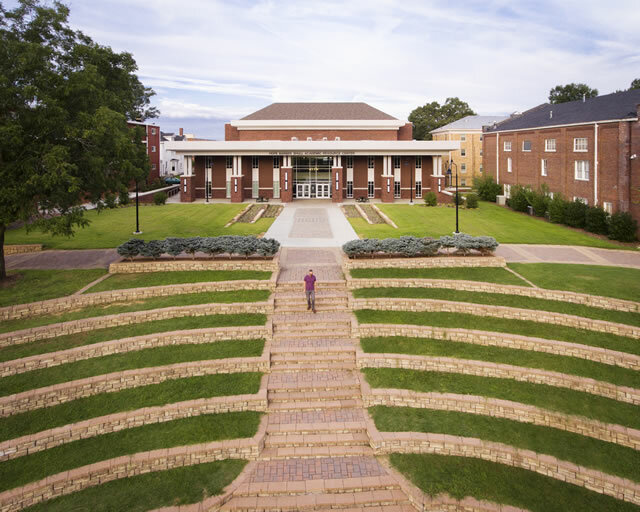 Hope Barber Shull Academic Resource Center at Freed-Hardeman University fulfills the campus’s need for a welcoming, modernized space that encourages academic rigor in a comfortable, flexible environment. 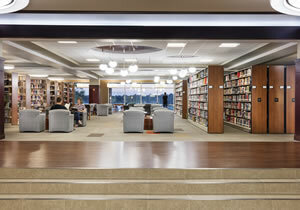 The 48,500-square-foot library represents both the university’s and the students’ dedication to academic success. To begin the planning process, the architect created an executive space program in collaboration with the university’s senior administration. Regularly scheduled meetings with user groups, senior administration and the contractor to communicate and coordinate the university’s needs assured that final design would meet those needs and that the facility would be completed on time and within budget. 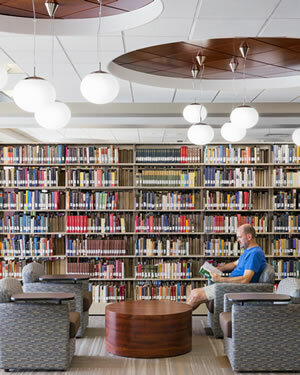 Before design began, multiple site studies over the course of 13 years were conducted on various areas of campus to determine whether or not the existing library should be relocated. As a result of the analysis, the team agreed that an expansion and renovation of the original facility was the best route to take to keep the library at the center and heart of campus. While the city did not permit closing of the neighboring street to accommodate the library’s growth, they waived the street set-back requirements. The decision to maintain the existing library footprint was also a cost-conscious one: by utilizing the existing building’s structure and shell, more of the budget was directed to the interior architecture. Also, the positioning of the building allowed designers to keep the sides more modest, while allocating the majority of the funds to the two entry facades. Continuous insulation installed in the existing exterior skin maintained an uninterrupted thermal envelope. 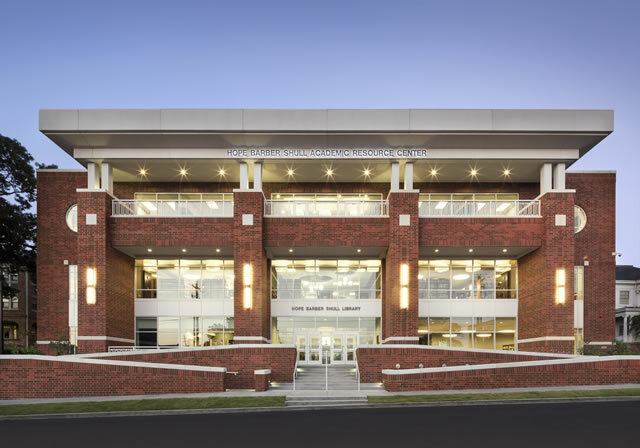 To marry existing and contemporary architectural styles, the exterior incorporates a mix of brick, aluminum storefront and shingles, which are consistent with campus standards. The street-facing side of the building is designed to show transparency to the community and, much like the interior structure, provides a welcoming aspect to the library. This façade also symbolizes the City of Henderson’s involvement in making the project a success. 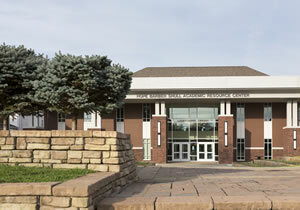 On the campus-facing side, the library plaza was regraded to allow entry into the facility at grade level on the first floor. Previously, visitors had accessibility issues at the front door because the entry was at a half-level, which required entrants to walk down to the first floor. As a result of the regrading, the plaza became a signature landscape element. The design also reenergized the library lawn and serves as a cohesive forecourt to the library, integrating the structure with the rest of campus. 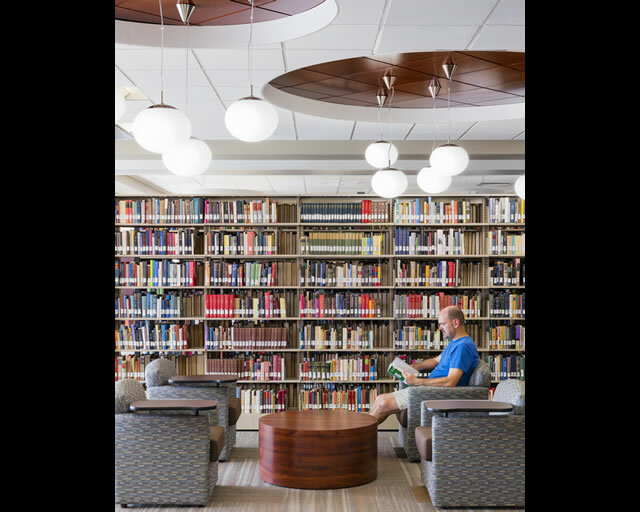 The updated interior architecture transforms the library space into a commons area that encourages and supports student collaboration and team-building. 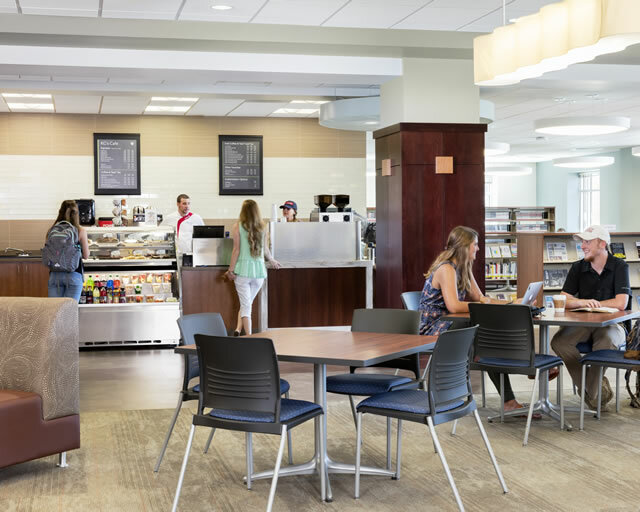 Inspired by evolving library typology that now trends toward open floor configurations, as well as the university’s focus on student collaboration and faculty mentorship, the interiors feature comfortable gathering spaces that facilitate student academic and social interaction. On the first floor, a café and learning commons serve as casual meeting places. The café, which has doubled its patronage after relocating from across the street, is particularly useful since food is permitted throughout the building. A flexible meeting room on the ground floor is utilized for university-wide events, board meetings, lunches and other functions and has its own entrance for access during library afterhours. A combination of group and individual seating arrangements contribute to the flexibility of the socialization spaces. Beginning on the second floor, the interior floor-to-floor heights of the existing building were much lower than today’s standards. The second floor of the new wing is two feet higher than the existing floor-to-floor heights. To resolve the issue, a unique seating area was created for students to gather and socialize on the steps. The two-foot height differential was small enough to be resolved with an accessible ramp for easy transition between spaces. All floors are equipped to support a full range of academic needs, making the new library an ideal study spot for FHU students. The iLearn Commons is a direct result of the university’s initiative to provide technology to students that benefits their academic pursuits. A combination of resource desk and help desk, this service offers hands-on assistance to the Mac-based campus. To limit the amount of traditional bookshelves, many books were purged and converted to a digital format, simultaneously making resources more accessible and opening up more physical space for students to work. The structure allows for more shelving to be added in the future if expansion is necessary. The third floor functions as a tutoring center that provides resources for both students and faculty. Video-monitored testing rooms allow the university to administer tests outside of the classroom, while online content recording rooms with high-quality projection capabilities enable faculty to record online course material. 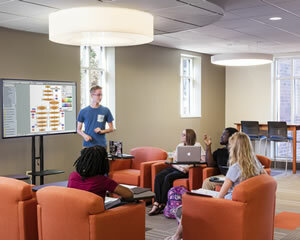 Located among the testing and recording rooms are an assortment of discipline-specific study rooms outfitted with marker boards and other resource material to accommodate a full spectrum of academic needs that range from those students who need to catch up to those students completing honors research projects. 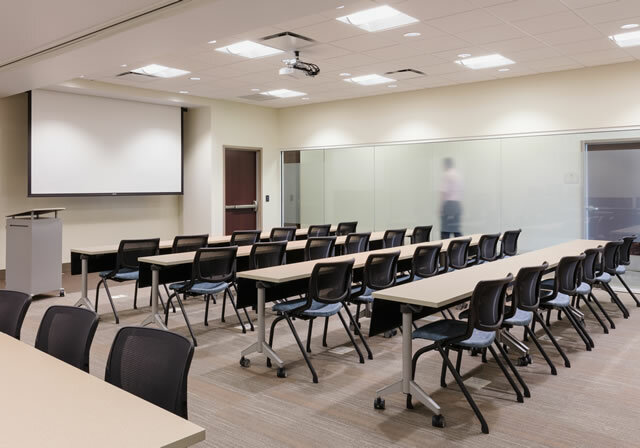 These rooms support small group study meetings, as well as one-on-one tutorial sessions with on-site tutors, whose offices are just across the hall. 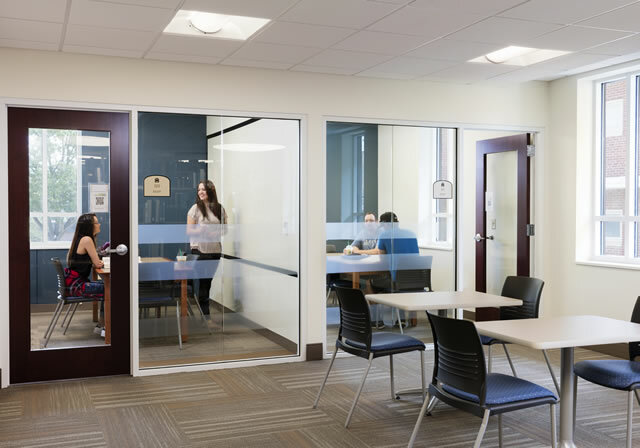 Finally, a flexible, glass-walled conference room with a partition wall is used for faculty instruction and for training sessions, as well as for large-group tutoring or review sessions. 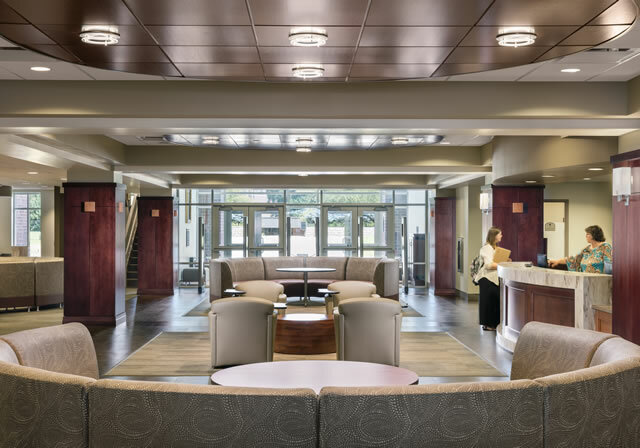 In selecting interior finishes, designers focused on creating an exciting new space with updated aesthetics, while maintaining a connection to the existing spaces on campus and honoring the history of Freed-Hardeman University. During several meetings among the design team, user groups and senior administration, factors such as durability, acoustics, space use and aesthetics were discussed, particularly with respect to the interior finishes. These factors then became the outline used to make finish selections. 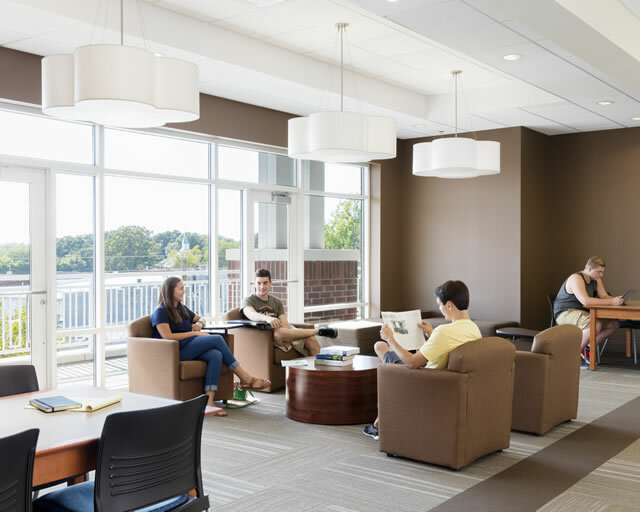 For example, hard surfaces were used in the first floor lobby for increased durability, while carpet was used throughout the majority of the remaining spaces to provide better acoustics and more comfort in study spaces. 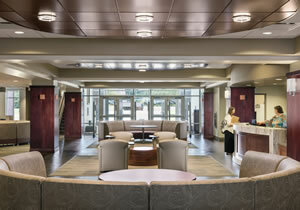 A warm and inviting color palette reflects the university’s desire for the library to be a welcoming and popular campus destination. Pops of color, specialty lighting and technology add excitement and make the space feel contemporary. Color blocking within the carpet and wall colors was used to denote areas where students might gather to collaborate or study. To minimize environmental impact, designers opted for low (or no) VOC paints and adhesives, recycled content and some LED lighting when possible. Offices were fit with occupancy sensors so lights shut off when the room is not in use. Similarly, toilet fixture sensors and low flow plumbing fixtures support an efficient use of water. The VRF mechanical system features additional sustainable features: an energy recovery unit ensures energy efficiency within the mechanical systems. In order to remain within budget, interior finishes included specialty materials only in highly-visible and featured areas that would provide the most value for the dollar. By paying close attention to material budget costs and utilizing materials that are simultaneously beautiful, durable and cost-effective, designers were able to balance the cost of the specialty materials and remain in budget. 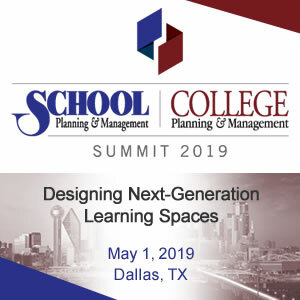 Ultimately, the success of the project lies in the students’ desire to be present in the space, as opposed to just using the new resources to accomplish their academic goals. With a diverse array of spaces and academic support offerings – from the café and iLearn Commons to the tutoring spaces and meeting rooms – the Hope Barber Shull Academic Resource Center fully addresses the campus’ social and academic needs. 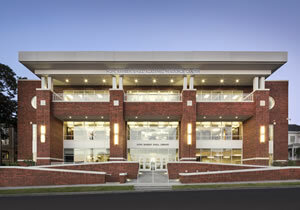 With its modern capabilities and warm atmosphere, the new library has become both a social and academic support destination for students and faculty on the Freed-Hardeman campus. Electrical Engineer: I.C. Thomasson Assoc. Mechanical Engineer: I.C. Thomasson Assoc. Civil Engineer: Clay Williams and Assoc.